BRIGHT TRADESHOW 11.07. &amp; 12.07.2009 WITH ELZO EXHIBITION! Carhartt will be again in room no. 45, which is located on the ground floor. 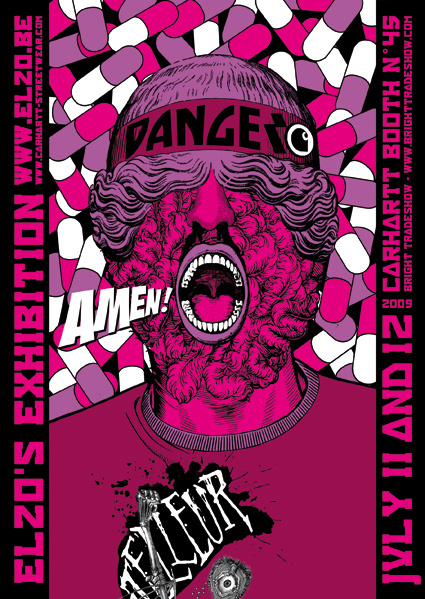 In addidtion to the new collection, there will be a show of Elzo Durt’s amazing artwork. Elzo is the maniac mind behind the Yama & Carhartt Mental Weirdo Asylum boards, a collaboration series of 4 signature models between us and Yama Skateboards. Meet all the mental weirdo’s inlcuding David Martelleur, Patrick Munz, Ferit Batir and Muki Ruestig, who will interrupt their one month voyage through Europe to come over to the Bright to celebrate the Yama and Carhartt Mental Weirdo Asylum Escape Race with you on the streetcourse on saturday at 16:30. Our balkan friend, skateboarder, gallerist, photographer and multitalent Sergej Vutuc is organizing an exhibition in his “Basementizid“-room featuring the works of Stephanie Solinas, Marcel Veldman, Ale Formenti, Jocko Weyland, Via Grafik plus Ricky and Buddy. And if this is not enough to motivate you to pay a visit, Lucas Fiederling and Mark Frölich will premiere their long awaited independent film “DONE” Saturday night at the MSM party. Carhartt teamrider Bülent Kurtca aka Gipsy Cobra has a full part! For more infos and an online version of the show’s magazine check www.brighttradeshow.com.